It turns Logic Pro into a game level editor. It makes a standard MIDI file into a terrain of platforms to explore. As you navigate, your footfalls on piano roll-visualized notes procedurally generate sound effects and music. And it turns General MIDI — and Super Midio, and my personal favorite, the SysExorcist — into heroes. 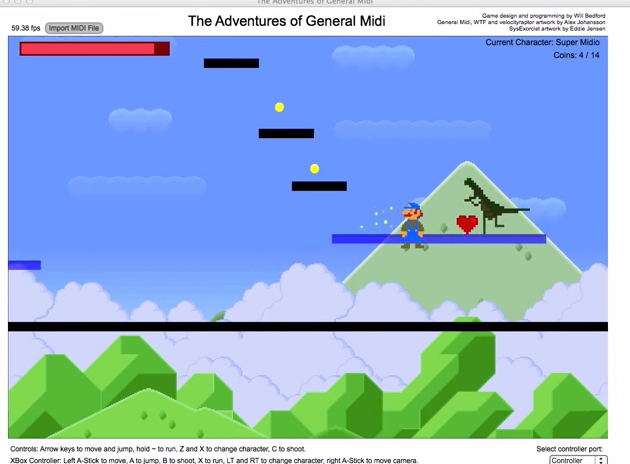 It’s Adventures of General MIDI, a platformer made from MIDI files. And it’s the creation of Will Bedford, who quips that he fails miserably at his own game in the YouTube video and gives up at the end. Even more unlikely (arguably), it’s built in Max/MSP. You can’t get this anywhere, but I got 12 minutes of amusement just watching him play. Let’s keep fingers crossed for an indie release, especially since it amusingly has MIDI file import. Adventures of General Midi is a platformer which generates levels based on the notes in a MIDI file. All the built-in levels were built in Logic, and there is an option to import your own MIDI files.